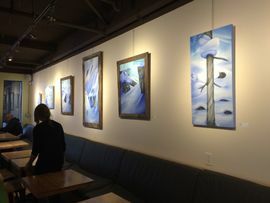 I'm so thrilled to announce that my winter collection of mountian-inspired paintings are at my favorite cafe in Pemberton this fall/winter! Mount Currie Coffee will have a collection of my paintings on display through the 2016-2017 winter season. Each painting is for sale either through the shop, or by contacting me directly, and each sale will contribute a portion to either the Canadian Avalanche Association or the BC Search and Rescue Association to support their never ending efforts to keep us safe in the mountains. Mount Currie Coffee is not only located in beautiful Pemberton BC surrounded by stunning white-capped mountains, they also serve a very tasty cup of joe to keep you going on those early morning dawn-patrol missions. Stop in and say hi to the friendly staff, and check out their new wall decor on your next adventure. Change is a good thing! My business cards have received a little face lift with help from the talented folks at Contact Printing in North Vancouver. Contact Printing is run by friends who are not only the sweetest people you will ever meet, but also have a great sense of humour - you can tell by that sign on Esplanade that has hilarious quotes to brighten your day. The new, bright, bold, business cards have one of my favorites "Thunderdome" on the front, with my contact info and a cool new logo on the back that I like to call the rotorflake. The World Ski and Snowboard Festival has taken Whistler by storm...literally. It's been snowing like crazy up there, which has made for arguably the best skiing all season! WSSF includes the annual State of the Art Exhibition featuring a wide variety of art influenced by the adventurous attitude and unique subcultures of Whistler. This year, I'm proud to announce that my Canvas Collection is included in the State of the Art show along with several renowned BC artists including RIKA, Chilli Tom, Vanessa Stark and many others (click here to see full list of artists). Stop by the Whistler Conference Centre to check out the exhibit and some cool live art all week long. Open from noon til 6pm every night this week until April 19th. Long live winter!! The Hollyburn Ridge Association has put together a collection of mutli-disciplinary artwork that celebrate mountain art and culture in an exhibit at the Ferry Building Gallery in West Vancouver. It was a privilege to have been asked to join this exciting group show that focuses on a topic I'm so passionate about. The show opens next Tuesday, August 19th and the public is welcome to join me and other artists in the first look at the apline art. I'll be featuring three paintings in the exhibitions - two of which are brand new. Hope to see you there! The Deep Cove summer banners are up! Check out my summer design for the street banners in a gorgeous Deep Cove setting. The banner project was completed this spring with generous supported from the Seymour Art Gallery, Big Bold Beautiful Banner Company, Deep Cove Merchants Association and Deep Cove community members. This design was inspired by my personal experience paddling on summer evenings near Cates Park. I hope the image relates to visitors and locals alike, inspiring others to explore their own beautiful backyard. ​The Deep Cove Merchant's Association together with the Seymour Art Gallery have put together a wonderful evening of music, arts and culture at the Deep Cove Yacht Club. The fundraiser even on March 22, 2014 will raise money for the beautification of Deep Cove, and will be the day my banner designs are unveiled for the community for the first time! 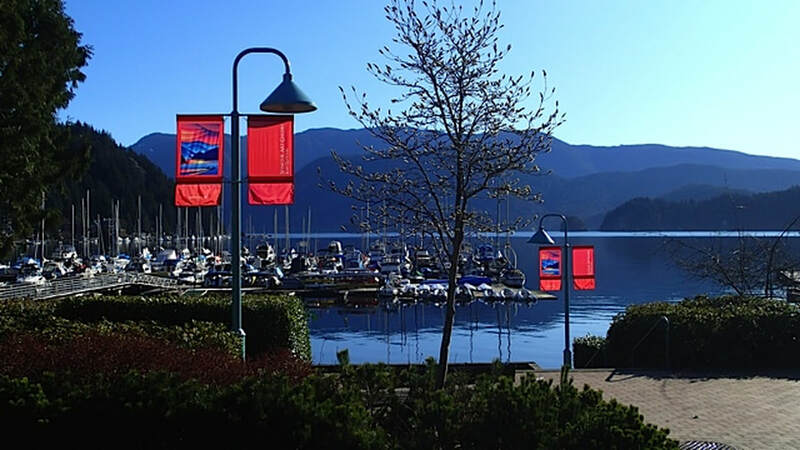 The banners will be on display through the streets of Deep Cove starting in the summer of 2014 through to winter. Check out the graphic design page for more detailed design images. This year for the first time, I'll be participating as an exhibiting artist in the Eastside Culture Crawl! This is an exciting chance to display my work in a casual studio setting while welcoming visitors to check out my work and have the opportunity to purchase it at wholesale cost. The Crawl does not charge commission on any paintings sold, which means all the work is 30-50% less than it would be at a gallery. This annual event is a great way to support new talent and explore the intimate working space of a wide variety of artists. A very heart-felt thank you to everyone who came out to the East Side Culture Crawl. Your incredibly positive feedback and support is so inspirational, and will certainly carry me into the new year for an exciting new series of paintings. 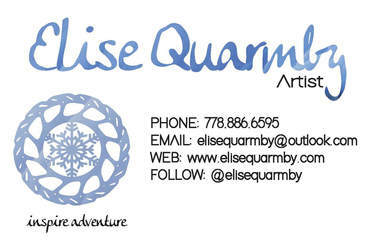 As of June 1st I will be relocating my canvases to a new studio at 1310 William Street in East Vancouver! The new space will be my primary painting studio, showcasing several works in progress along with a few completed pieces. 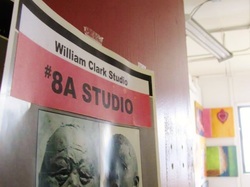 A collection of talented and inspiring artists currently work at at the William Clark Studios, and I can't wait to be a part of this dynamic, creative environment. Please contact me if you'd like to set up a time to stop by! ​Starting January 14th, the Canvas Collection will finally be for sale to the public! 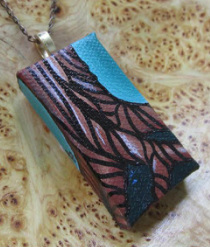 This fashionable collection of tiny painted canvas necklaces will be featured this spring and summer at the Gift Box Gallery at the North Vancouver Art Council's CityScape Community Art Space. 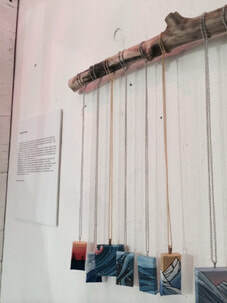 Check out the collection for a limited time at this beautiful gallery space in Lower Lonsdale. *The gallery is located at 335 Lonsdale Avenue in North Vancouver - a short walk from the sea bus, and right in the heart of eclectic Lower Lonsdale. ​The Raincoast Conservation Foundation along with renowned BC artist, Mark Hobson, present a groundbreaking art exhibition that brings awareness to important environmental issues currently threatening British Columbia's west coast. My newest painting, Solitude, will be featured in the "Art for an Oil Free Coast" exhibition, which will travel to Vancouver, Victoria, Saltspring Island, and Nanaimo. The show will open on November 27th from 7:30 to 9:30pm with a reception at the Performance Works Gallery on Granville Island. Everyone is welcomed to attend this exciting exhibition and to support the Raincoast's efforts to preserve our irreplaceable coast. To find out more about Raincoast or to check out dates and events associated with the Oil Free Coast initiative, click here. An exciting new venture has opened up this year with Backcountry Magazine and G3's annual Skigraphiks contest! The above design, Abstract Terrain, is my latest abstract on canvas painting done to scale and designed specifically for a pair of skis. Painting of the Cypress Mountain Mural is currently underway in the rental facility. 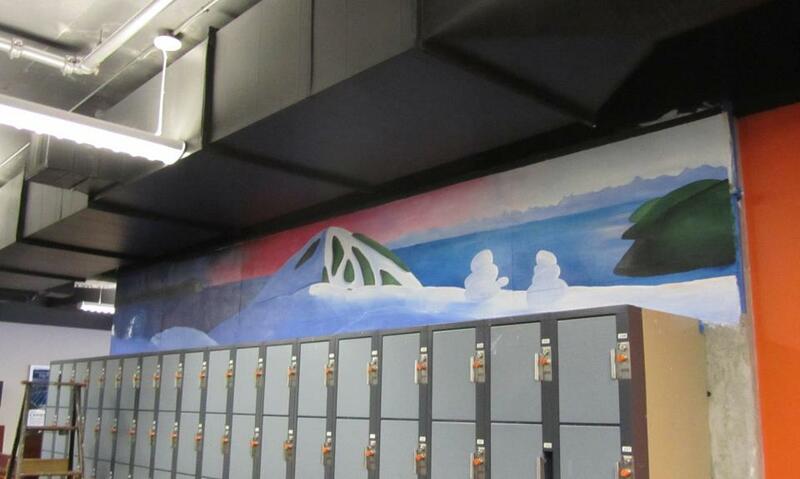 After a weekend of painting, it is about 75% complete, with only a few snow ghosts to go! Cypress surprised us with a record-breaking early opening for the 2011-2012 season last weekend. Although I was hoping to finish the mural before the opening, it should be completed in the next few weeks depending on staff and resource availability.